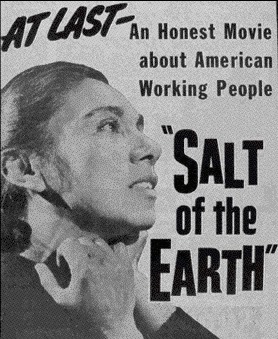 Join us for a screening of landmark U.S. labor film Salt of the Earth (1954) where a largely Mexican American union overcomes court injunction to gain more equitable working and living conditions. Based on collaboration between the zinc miners whose experiences inspired the film and blacklisted Hollywood talent, it serves as both a rallying call for racial justice, gender equality, and labor activism, and a model for collaborative artistic practice. 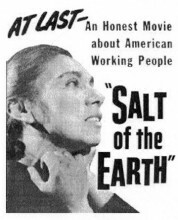 Salt of the Earth stands as a powerful artifact of resistance to America’s Cold War culture of conformity—an era defined by reactionary politics, union busting, and blacklists. 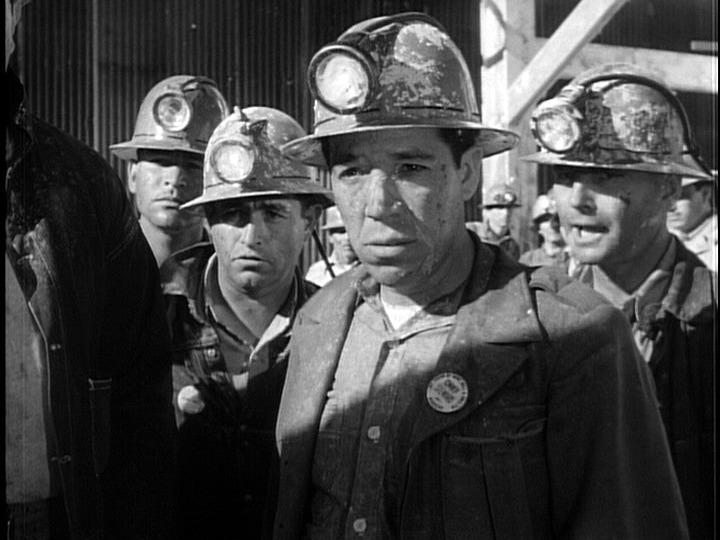 The film recreates the 1951-2 strike against the Empire Zinc Company in New Mexico where a court injunction barred workers of the Local 890 chapter of the International Union of Mine, Mill, and Smelter Works from the picket line. As the strike continued, the community’s women assumed increasingly active leadership roles in the protests, defiantly picketing Empire Zinc themselves. The 15-month strike ultimately led to considerable gains for the workers and their families. In translating these events to the screen, the film invokes a decidedly feminist stance, arguing as much for miners’ workplace safety and as its does for gender equality and inclusion. But to consider just the film text speaks to only part of its power, for struggle and resiliency characterizes Salt of the Earth’s production context from its very conception. The film’s origins lie with Paul Jarrico, a Hollywood producer and screenwriter whose refusal to cooperate with the House of Un-American Activities Committee (HUAC) landed him on the blacklist in 1950. Unable to find employment, he formed his own production company, Independent Productions Corporation, and saw the protracted struggle in New Mexico as perfect source material. Jarrico brought in Herbert Biberman, one of the original “Hollywood Ten” to direct; unfriendly HUAC witness Michael Wilson (fresh off an Academy Award win for his screenplay of A Place in the Sun) wrote the script on location, observing the events as they unfolded. When the strike ended, Wilson’s treatment was met with hesitancy from the participants who demanded extensive revisions to the script. 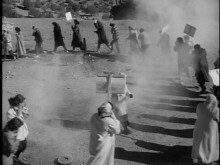 This collaboration between the filmmakers and the community was a defining feature of the film’s production and is reflected in the cast itself, comprised almost entirely of Local 890 union members and their families who restage their meetings and recreate their chants on the picket line during the film. Hostilities from government authorities and reactionary members of the Hollywood community plagued the production. Actors and crew received menacing phone calls, employees dropped out of the project, and Mexican actress Rosaura Revueltas—the film’s narrative and emotional focal point—was deported in the middle of shooting on trumped up passport violations. Lab after lab balked at processing the film and editing facilities were nearly impossible to come by. 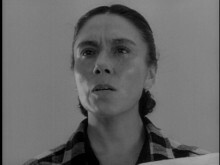 Jarrico, Biberman, and others worked under assumed names throughout post-production and engaged in an array of subterfuge to complete the final project. Salt of the Earth premiered in New York City in March 1954, and was met warmly by critics; it played abroad to even stronger acclaim, earning best foreign film accolades from the Academie du Cinema de Paris. Yet domestically, it remained virtually unseen. Condemned on the floor of the House of Representatives, protested by the American Legion, and pushed off screens by an industry that threatened to cease business with any theater willing to show the film, it is said to have played in less than fifteen commercial theaters across the United States. With the rise of socio-political movements of the Sixties and Seventies, the blacklisted film slowly began to find an audience. In 1992, the Library of Congress added Salt of the Earth to the National Film Registry for being “culturally, historically, or aesthetically significant.” It remains today a vital emblem of hope in the continued struggle for civil and human rights. Free and open to the public; no RSVPs necessary. A Crime to Fit the Punishment [documentary on Salt of the Earth], Barbara Moss and Stephen Mack. 1982; (Brooklyn, NY: Icarus Films), DVD. Benjamin Balthaser, “Cold War Re-Visions: Representation and Resistance in the Unseen Salt of the Earth,” American Quarterly 60.2 (June 2008), 347-371. Herbert Biberman, Salt of the Earth: The Story of a Film. Boston, Beacon Press, 1965. James J. Lorence. The Suppression of Salt of the Earth: How Hollywood, Big Labor and Politicians Blacklisted a Movie in Cold War America. Albuquerque: The University of New Mexico Press, 1999. Tom Miller, “Salt of the Earth revisited,” Cineaste 13.3 (1984), 31-36.